What do we give up in DNA privacy? The article is mostly about the collection of personal data on sites like Facebook and GMail, even from our Fitbit trackers… but does include the comment above. So, Cheryl, wanted to know, did The Legal Genealogist have any comment? But that doesn’t mean we don’t give up some of our privacy when we DNA test or when we upload our information to a third-party sharing site like GedMatch or DNALand. To some extent, we all do — and we need to be aware of just what we are giving up when we test. Before I go on, let me make it clear: I don’t think the risk is a big one. I personally have tested with just about every DNA testing company that’s out there and have a couple more kits on order. I have contributed my DNA to those third-party sites. I’ve done that because the genealogical upside of connecting with cousins who may have data critical to my family research is enough — to me — to outweigh any downside of making my DNA data available. But that’s a decision each and every one of us needs to make individually — and we can’t make an informed decision if we don’t know what we’re being asked to give up in terms of our own data. So here’s the key point: before we test, before we ask a family member to test, before we buy a kit for someone we hope may turn out to be a family member, we have to read the fine print. And we need to make sure the person who’s testing, if the kit is for someone else, reads the fine print too. Every testing company requires the person tested to sign or provide a consent in some form. What that consent extends to is set out in lengthy documents called either terms of service or something like privacy document — or both. 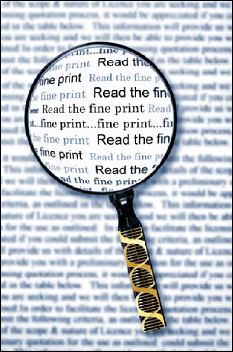 Every testing company’s requirements are different, and you need to read carefully the fine print at the specific company where you’re testing. Every testing company requires a certain level of consent in order to test with the company at all, and then may have an opt-in where you can choose to participate in studies ostensibly for the benefit of science and medical advances (but — let’s face it — are ultimately intended to benefit the testing company). So the first thing we need to do is carefully distinguish between permissions that are required and those that are optional. It’s only the required permissions that we have to agree to in order to do the testing. There’s a broader opt-in for more detailed research, but this much is required — you can’t test with AncestryDNA without accepting this. If test with any other service, like the new testing at MyHeritage, or if you go further and choose to upload your DNA data to a third-party site like DNALand or GedMatch, each of those sites will have its own required privacy statements and rules. Under any of them, you will be agreeing to give up some degree of privacy in and control over your data. Bottom line: read the fine print. You may well decide, as I have, that the risks are well worth it given what we can learn when we test. But we can’t give informed consent if we don’t read the terms of what it is we’re consenting to. Thank you again for this. I visit frequently with patrons at our Family History Center about reading before choosing. Over a year ago I removed my DNA account from ancestry.com. I have to assume that they kept their own copy of my results. I put my raw data at GEDmatch, DNALand and FTDNA.I often wonder what ancestry.com is using my data for now. I was a blood stem cell donor for my sibling who has leukemia. The hospital where the collection/transplant was done had a optional program in which I could donate two teaspoons of my blood for future DNA research, where it would be stored with a sample of my siblings’s pre-treatment blood. The release form for participating was SEVEN pages long, and full of promises of privacy! The release form for the actual collection of stem cells, with side effects up to and including death, was only one page. The doctor was extremely grateful that I opted in to the research program–and amused when I explained that my DNA was “already out there all over the internet,” linked with my email, for genealogical purposes. That may be true in terms of reporting, but in terms of information that’s captured… maybe not. Nobody, under any circumstances, can “guarantee the security and privacy of their data” — including secret government agencies, which are hacked as well. I’m a big believer in spreading my personal info around so no one company will have all my data. While I am a big user of Ancestry, I’ve chosen to do DNA testing with Family Tree, despite the inconvenience. We just can’t assume that ticking a privacy box will protect us. It’s all ultimately hackable or even just subject to security neglect. We should treat our personal data like nuclear fuel, it can hang around for a long, long time, and we can never assume that someone in the future won’t find a nefarious use for it.